Explanation: What creates these changing streaks on Mars? Called Recurring Slope Linea (RSL), these dark features start on the slopes of hills and craters but don't usually extend to the bottom. What's even more unusual is that these streaks appear to change with the season, appearing fresh and growing during warm weather and disappearing during the winter. After much study, including a recent chemical analyses, a leading hypothesis has emerged that these streaks are likely created by new occurrences of liquid salty water that evaporates as it flows. 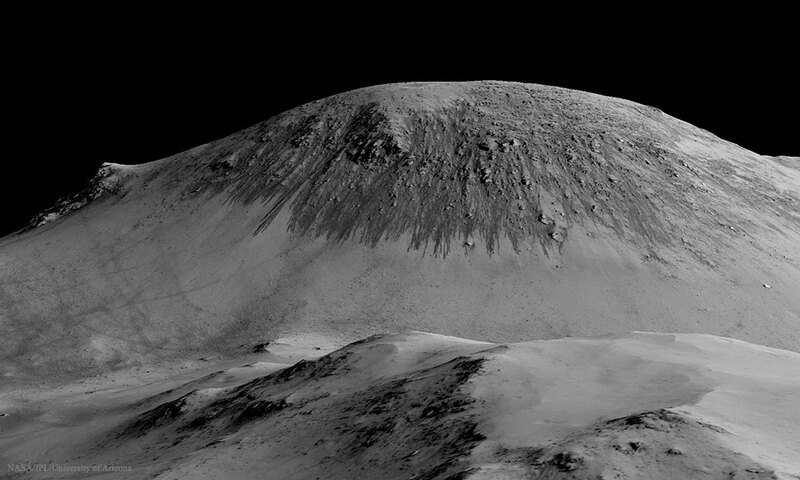 The source for the briny water is still unclear, with two possibilities being condensation from the Martian atmosphere and underground reservoirs. An exciting inference is that if these briny flows are not too salty, they may be able to support microbial life on Mars even today. The featured image of a hill inside Horowitz Crater was investigated by instruments aboard the robotic Mars Reconnaissance Orbiter that has been returning data from Mars since 2006.